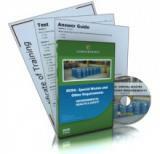 Train your employees about the regulations established by RCRA for generators (anyone that generates hazardous waste) for waste minimization, container management, waste tanks, and air emissions. RCRA regulations apply to any company that generates, transports, treats, stores, or disposes of hazardous waste. This course covers hazardous waste identification, hazardous waste lists, codes, and characteristics, and the mixture rule. The Resource Conservation and Recovery Act (RCRA) was passed by congress in 1976 to manage hazardous wastes. RCRA regulations apply to any company that generates, transports, treats, stores, or disposes of hazardous waste. Prepare your team in the regulations and requirements in working with hazardous waster. This course covers preparation steps for transportation, hazardous waste training requirements, hazardous waste manifest, land disposal restrictions (LDR), and alternative treatment standards.